Crown, one of the world’s largest manufacturer of electric lift trucks, was honoured with the international Universal Design Award for its WT 3000 pallet truck series at the HANNOVER MESSE trade fair on 26 April 2012. To win this award, products must fulfil evaluation criteria that include: broad and flexible usability, easy and intuitive operation, and safety and error tolerance. Last year Crown’s WT pallet trucks won the iF Product Design Award 2011 and the IDEA Award 2011 in gold, making the Universal Award the third award they have received in less than a year. Crown’s WT 3000 pallet truck series has been recognised for its increased focus on ergonomic features and the positive impact on health, safety and operator comfort that such features provide. This has also been confirmed in a study on electric pallet trucks conducted by the independent Institut National de Recherche et de Sécurité (INRS) in France. Even the most efficient lift truck is only as good as its operator. As the pressure to achieve more increases in warehouses and logistics centres, employers in this sector are increasingly focusing on the health and welfare of their operators. Companies are not only choosing pallet trucks for their performance, but also, increasingly, for their ergonomic and safety features. Crown identified this growing demand in their extensive onsite research that it conducted at the beginning of the WT 3000 development process. One of the unique results that came from the research was the FlexRide™ suspension system, developed and patented by Crown. The system achieves an 80-percent reduction in the impact of shock on operators repeatedly driving over dock boards. This means operators can drive over uneven surfaces without having to reduce speed, thus significantly increasing productivity while minimising strain on the spine and joints, as well as reducing the symptoms of fatigue. The INRS study entitled “Analysis of the vibration behaviour of six electric rider pallet trucks available on the market – effectiveness of their suspension” examined the vibration behaviour of various electric pallet trucks. The main aim of the study was to evaluate risks and to present preventive measures for certain types of vibration at work. This is based on an EU vibration directive, which was adapted into a French law, that set “minimum health and safety requirements regarding exposure of workers to the risks arising from vibration. The INRS analysed six pallet trucks and focused on criteria such as the vibration emission value of each machine, which is a good indicator of the performance of the machine suspension. 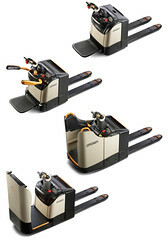 The WT 3000 pallet truck series, which is available with a flip-down platform or a fixed platform, stood out for its two types of FlexRide suspension system. The flip-down platform with FlexRide achieved a vibration emission value of less than 0.6 m/s. INRS described this as “excellent”. The fixed platform, which can be adjusted to the operator’s individual weight, had a rating of 0.5m/s. INRS said this was “remarkable”. The WT 3000 pallet truck series includes models that can handle loads of up to 2,500 kilos. Moreover, the series offers a choice between mechanical and electronic steering, as well as four operator platform types. The pallet truck is available with a foldable platform (with or without side restraints) or a fixed platform (with a side or rear entry). The quick-exit side restraint can be raised in the foldable platform model, allowing the operator to exit the truck from the side and increasing operating efficiency. The fixed-platform, rear-entry model is also available with the patented weight-adjustable FlexRide feature that provides increased, virtually shock-free rider comfort. The patented Entry Bar Safety Switch, which stops the truck immediately if the operator’s foot is outside the truck perimeter, is another innovative feature of the fixed platform model. French seafood exporter Adrimex tested a number of electric rider pallet trucks when it started thinking seriously about vibration prevention during the renovation of its warehouse. Crown’s WT pallet truck received a very positive rating on account of its FlexRide feature, which provides effective shock absorption and a high level of rider comfort. The pallet truck’s additional safety features, such as the patented entry bar safety switch, which prevents the truck from starting if the driver’s foot is on it, also played a major role in the positive evaluation. As Pierre Boucard, despatching manager at Adrimex confirms “It was the drivers themselves, consulted by the management, who chose the new equipment”. Crown Equipment Corporation is one of the world’s largest manufacturers of electric lift trucks. Since the company first started building materials handling equipment in the 1950s, Crown products have won numerous industry accolades. From the smallest pallet trucks through to the largest VNA trucks, Crown uses leading-edge design, innovative engineering and high-quality manufacturing techniques to respond to the full range of customer needs, achieving exceptional standards of reliability and productivity.